Acupuncture has been practiced throughout Asia for over 3,000 years. It is an ideal adjunct to chiropractic care. Dr. Buzbuzian recommends acupuncture whenever he sees health problems caused by disruption to the body’s vital energy or Qi as it circulates through pathways in your body called meridians. This centuries-old healing art focuses on the integrity of bodily systems and not specific conditions. The most common question we get is about the needles we use. Most people’s experience with needles is of hypodermic or sewing needles, or perhaps safety pins or push pins. These types of needles or pins are rigid and quite large compared to the ones we use. In fact, five of our acupuncture needles could easily fit inside the shaft of a hypodermic needle! And rather than being hard and rigid, acupuncture needles are soft and flexible, purposely designed to penetrate the skin easily with little or no discomfort. We use only pre-sterilized, individually sealed, stainless steel needles that are safely disposed of in a bio-hazard container after their use. When we first insert these ultra-fine, sterile needles at special energy points on your body, most people report a small and mild prick, like that of a mosquito bite. For a few, there may be some initial but very brief discomfort that is easily relieved by backing off or removing the needle should any discomfort persist. Any painful or uncomfortable sensations more than this are usually the result of a vivid imagination and not our needles! No one knows for certain. 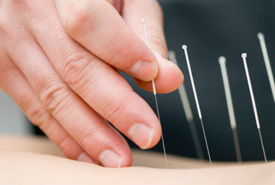 Theories for how acupuncture works are many and varied and often times colorful. Explanations may differ greatly between a scientist or researcher and that of an experienced master trained and skilled in this centuries old healing art. We just know it does. Perhaps the best way to think of acupuncture is to imagine rivers of energy circulating throughout your body, similar to how blood, lymph fluid and nerve energy moves through our body. This energy or Qi is contained and organized within meridians or channels, similar to the body’s vast and extensive network of blood and lymph vessels. These meridians can experience a “log jam” whereby the body’s flow of vital energy or Qi becomes restricted and stagnated. Acupuncture needles help loosen this logjam, thereby restoring the proper and essential circulation of the body’s vital energy. Acupuncture visits typically take 20-40 minutes and can be preformed while either sitting or laying down. In most cases patients do not need to disrobe or put on a gown. Most people experience a variety of post-session feelings, which range from alert and energized to a deep sense of relaxation and well-being. Some may notice an immediate improvement in their symptoms or mood. Others may require a few treatments before noting any benefit. 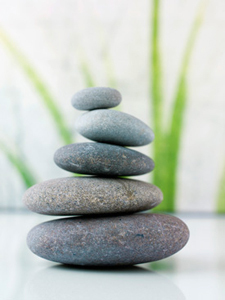 In either case, acupuncture has stood the test of time because of it’s safety, efficacy and affordability.